Also? It drives me nuts. How hard can it be to use the same cup all day? Just one day. Not a month or a week. Just a single day. That's all I'm asking. "It has to be one of yours. Because it's not mine, and I'm pretty sure Oz can't reach the water dispenser." I couldn't handle it any more. So I decided to try a new thing. And it's actually working pretty well. I bought some plain cork coasters at Walmart - they were around $4. 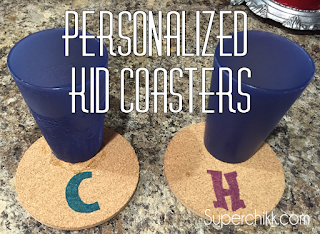 Then, I traced a C and an H on the coasters and colored them in with Sharpies. 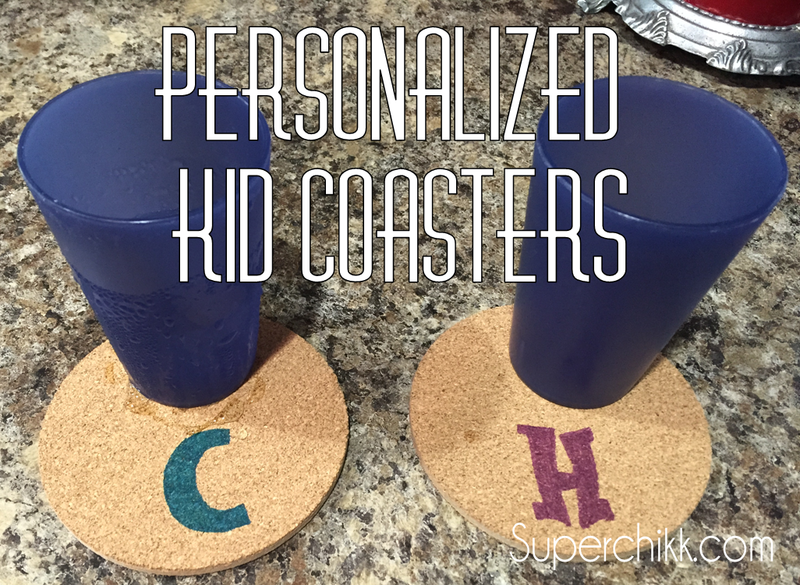 Now, when the kids get a cup out, they're supposed to set it on their coaster after getting their drink. It keeps drippy cups off the counter, and it gives them a single place to put their cups. I know I'm not the first person to use this little trick, but it's made a huge difference in the state of my kitchen and the number of cups sitting around the house. Now, if I could only manage to make it work in the kids' bathroom, too. We're still set up to fight aliens in there. But one day...one day. So the other day, after spending the better part of the day cleaning, vacuuming, and washing cars, nothing sounded better than some Red Velvet. Oh, and a shower. Since we got a new waffle iron a month ago, it's been like a game at our house to see how many different things we can make in it. I've even menu planned "Waffle Iron Night". I blame Pinterest. But it seemed like a perfect way to whip up some quick Red Velvet goodness. Let me break it down for you. Are you ready? It's super complicated. 2. Take your waffle iron out of the cabinet and turn it on. I used medium heat. 3. Follow the directions on the cake mix box as you would for a cake. 4. 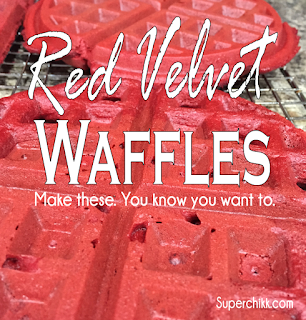 Pour the batter on the hot waffle iron and cook until done in the middle and still soft on the outside. 5. Repeat until all the batter is gone! I "frosted" mine with some cream cheese stuff I had left from making a strawberry pie. It was basically a block of softened cream cheese and a cup of sugar mixed on high in the mixer. For a better consistency, use powdered sugar and add milk to thin to your desired thickness. Now, go make some. You know you want to. I’ve discovered that long breaks aren’t really beneficial for us when it comes to school work. So our strategy for this summer will be a bit different. I don’t want to necessarily do a year-round school schedule – planning a more traditional school year with the breaks we need works for us. Continuing in the summer is going to be helpful for us, but I want to do something besides what we normally do throughout the year. I don’t want to be a total stick in the mud, and I need a break, too. So we’ll take a few shorter breaks during the summer, and do our “summer school” schedule the rest of the time. Summer Vacation: I will require a minimum of 30 minutes of reading each weekday, even when we’re on summer vacation. Caedmon will read (hopefully independently a lot) and Honor will either look at books herself or we’ll do read-alouds. Both kids will also be required to draw/color/do something creative each day. Summer School, Caedmon: The 30 minute/day reading requirement will continue to apply. We’re also going to begin a vocabulary program called English From the Roots Up. It’s meant for older kids, but Caedmon has an interest in Greek and Latin, and we won’t start formal Latin studies until 3rd grade. I thought this might be a good way to introduce some Greek and Latin while at the same time, maybe help him with vocabulary and spelling. I’m adapting it for his age and skill, so I’ll let you know how that goes for us. After reading and vocabulary, Caedmon will have a few things to choose from. He’ll choose one thing from Category 1 and one thing from Category 2. I think those options will give us plenty of variety and keep us from getting bogged down in the work. It also won’t take terribly long. 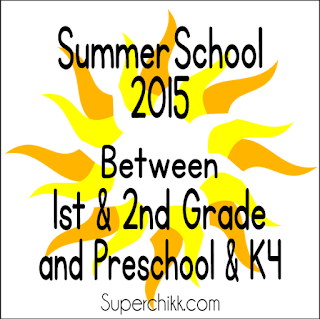 Summer School, Honor: I had originally planned to start “school” with Honor in the fall, which would be her K4 year. So I bought a few things at a curriculum sale this past spring with that in mind. And then she insisted that she needed to start school now. So we did. And she loves it. Her thinking and reasoning skills are outstanding, but her writing skills aren’t quite there yet. (She just turned 4 – so she’s developmentally appropriate with writing.) So we’ll continue adapting the work so she can work at her own pace and worry about writing skills a little later. Aside from 30 minutes of book time, Honor will have computer/iPad time for phonics and reading type sites/apps. She’ll also continue to work through Building Thinking Skills and Mathematical Reasoning. I’ll evaluate at the end of the summer and let you know how it goes! 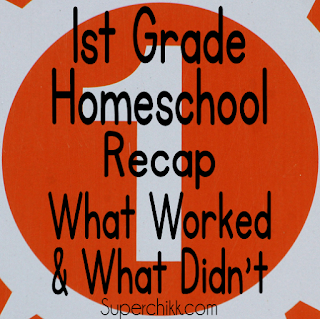 To read about my 1st Grade prep process, check out this post. I’ll be going down the list item by item for recap purposes. We finished 1st Grade over two weeks ago! Boom! 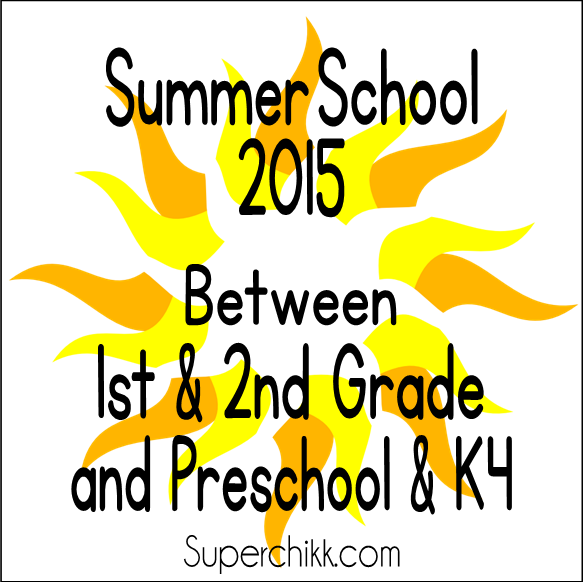 First, we ended up doing about five school days worth of “work” over the summer between kindergarten and 1st. It was mostly through field trips and book studies. It was good to have those days under our belt, and we didn’t completely lose our heads, but I think a more consistent summer “program” will be better for us in the future. I’ll talk about my plans for that another time. Reading: My plan: use library books. How it went: great! I probably was not as consistent with making Caedmon have “book time” on a daily basis as I should’ve been. But he read aloud a lot to me during our lessons. He reads better than he gives himself credit for, he just needs to build confidence. He’s started reading to Honor a bit toward the end of the year, but it’s challenging because she prefers to be the one in charge of the agenda. To sum it up, I think library books along with reading during his other lessons was good for him. We also did a few “book studies” – usually during a time we were taking a break from other subjects. Spring Break, for example. We took a couple of days off, but since taking an extended break isn’t beneficial for us, we continued the other days with a few light subjects and reading a book (like Charlie and the Chocolate Factory) and did a character study, coloring pages, etc. Pinterest is an awesome place to find resources for book studies! Writing: My plan: use Writing With Ease Level 1. How it worked: great! I like this program – it teaches copywork at this age, as well as listening and narrating. It also gave us a jumping-off point for some of our reading. I’m SO glad I got the workbook. If I hadn’t, I would’ve had to come up with all his copywork on my own. No thank you. Writing is definitely not Caedmon’s favorite subject, but I felt like this gave him great practice and incorporated grammar elements along the way. Math: My plan: use Saxon1. How it worked: really well. I like the concept behind Saxon – continually working on things you’ve learned while adding new skills. It seems slow to add new things sometimes (and I grow super weary of all the “meeting” stuff), but it has been a good program for us. It has lots of hands-on elements, which Caedmon really enjoys. Honor often participates with us during those exercises, even if it’s just playing with pennies. The only thing I really don’t like is that on Assessment (test) days, it gives you a written assessment, a fact sheet, and a problem sheet. That’s a LOT of work. So, I usually ditch the fact sheet or problem sheet on those days. I’d save them for a day we needed extra practice. I found the “make your own flash cards” tedious and unnecessary since they include flash cards with the workbooks, so I quit making them about halfway thru the year and we just used the cards that came with it. During the last few weeks of 1st Grade, I began incorporating Kahn Academy into our math program. We were going to run out of math lessons before we ran out of school days, so I sprinkled it in to stretch it out a bit and give Caedmon a bit of a change-up. He enjoys computer work, so I thought he would like this. He does, for the most part. There’s a bit of a challenge sometimes because it presents problems in a different way than he’s used to seeing with Saxon. But usually after we work through one of them together, he’s able to continue on without help. Bible: My plan: use The Gospel Project app. How it worked: great! The kids both love this app and the videos are fun to watch while teaching solid biblical principles. I love that it’s a chronological walk through the Bible. He is still “journaling” by drawing pictures, but he’s learning and enjoying the Bible, and that’s what’s important. Spelling: My plan: Spelling Workout A. How it worked: meh. Don’t love it, don’t hate it. I think part of the difficulty is that it requires writing and Caedmon doesn’t enjoy writing. He also doesn’t quite see the parts of words yet – like –ing, -ed, or the two words in a compound word. I think we need more phonics work before tackling spelling, honestly. I kind of wish I had skipped spelling this year. I’m not entirely sure it has been beneficial for us. Or maybe a more phonics-focused program would’ve been better for him. We will be trying something different next year. Language Arts: My plan: First Language Lessons for the Well-Trained Mind, Level 1. How it worked: great. Love that the lessons are short and sweet. Most don’t require writing, and the ones that did, I often allowed him to use the white board instead of paper. I do feel like it’s slow to teach a few things, but I like the simplicity. History: My plan: Story of the World, Volume 1. How it worked: fabulous. Caedmon loves history. I loved the audio book of the textbook! We listened to history in the car while running errands, and it was one less thing I had to read aloud. It was also more “user friendly” because the kids both felt like they were listening to a story instead of a lesson. We used the Activity Book for narration guidelines, activity sheets, and maps. Caedmon has immensely enjoyed the mapwork. Honor loves to color a picture along with us since she’s listening to the “story” too. We supplemented a lot with books from the library, which wasn’t hard to do at all. We tried to use the Usborne and Kingfisher encyclopedias, but they’re a bit cumbersome for a 1st grader to handle, and they contain so much information, it was kind of an overload for us both. They’re awesome books and I know we’ll use them more in the future, but smaller, more kid-friendly books from the library were better for us. We did not do tests, but will incorporate those next year. Science: My plan: use DK Animal and Human Body Encyclopedias as a jumping off point, and study gardening. How it worked: pretty well. I have to admit, I’ve been pretty relaxed about science this year. I chose topics from the encyclopedias, we read those pages, and checked out supporting books at the library. After reading our pages together, I gave the library books to Caedmon and told him to “go learn things” and had him report back to me with one thing he learned from each book. I wrote those down on our narration sheet and we discussed the pictures, he asked questions, etc. For gardening, we checked out some books at the library, he’s helped me prep our garden beds, plant seeds, maintain our seedlings, and has chosen to grow a watermelon plant as his “project.” My theory is that we have plenty of time to get into the details of science. We’ll repeat these subjects again at least twice. At this point, I want to introduce topics and concepts and let his curiosity take over. He conducted an experiment last week to see if you really can’t taste stuff when you hold your nose (we were studying digestion). He thought it was awesome…and I thought it was awesome that it was his idea to try it out. Enrichment: Caedmon attended an “enrichment” class one day a week from 9am-2pm with other homeschool kids his age. He loved it, and so did I. It was valuable for him to be in a classroom setting, interact with other kids in that setting, and learn from someone who’s not me. He actually learned some things there before we got to them in our books, which I loved. I heard more from him about lunch and recess than anything else, and I’m not sure that’s entirely abnormal. It was a place I could feel good about sending him, knowing I could trust not only the teachers, but the content. Sports: We’ve played the sports. Caedmon played baseball last summer, then he and Honor both took swim lessons in the fall. He played basketball in the winter, and we finished up the spring with swim lessons for both kids again. While I think playing sports teaches some great lessons (and gives an outlet for physical activity), the schedule is difficult for all of us when both kids aren’t participating at the same time. So, my favorite has been swim lessons. Both kids can participate at their own level during the same time slot, and we all get the benefits. Keyboarding: In January, I added a keyboarding course from Keyboarding Without Tears. Caedmon has enjoyed having a “school” reason to use the computer, and I love that it’s teaching him how to actually type. I chose 1st grade level, though they offer kindergarten. It’s all online and I found it very affordable. Math: As I mentioned above, we added Kahn Academy during the last month of school. We’ll continue using it throughout the summer. Best part? It’s free. Explode the Code: The best way I can describe ETC is that it’s phonics, but incorporates spelling and reading. I brought it in when we finished our Language Arts book, and we’ll continue with it over the summer. So, has 1st Grade been all sunshine and roses? Hardly. There have been days when we didn’t want to school. There have been days when we both had to take a break…from the books and from each other. But there have also been days that were painless. And even fun. And seeing the light come on in those little eyes when the brain finally makes connections has been priceless. 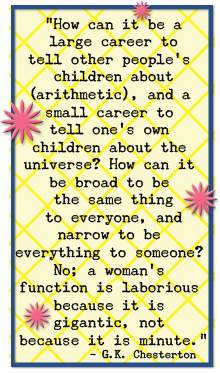 I will also say that having a homeschool support group makes a world of difference. 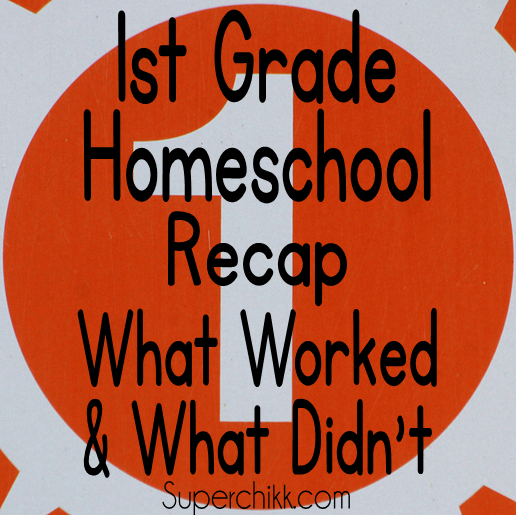 We are part of a small group of families who homeschool and have the same values we do. We do field trips together, have park play dates together, encourage each other, celebrate victories, and support each other when we have rough days. This journey would be so much more difficult without those other Mommas who are in the trenches with me. Now, on to 2nd Grade and Pre-K…yes, already. I’ll talk about those very soon! Simplification is all the rage. But it gets kind of complicated. Capsule Wardrobes are the thing right now. Basically, the idea is to limit yourself to a certain number of versatile clothing items for each season. You wear the same 37 (or so) articles of clothing/shoes in different combinations for 3 months, then pull everything else out of storage and remix your wardrobe for the next season. (That doesn’t include undies/socks, workout clothes, pajamas, etc.) The idea is to only purchase things you love and will work well with things you already have. Given the blog posts and Facebook links I’ve seen on this topic lately, it’s a brand new idea no one’s ever thought of before. But here’s the thing. The Capsule Wardrobe is supposed to simplify your daily life. And I love that. But switching out clothes from storage every three months? No way. Talk about un-simplifying things. Let’s be honest. I do good to move my kids’ shoes and clothes out of their closet when they’ve been too small for 3 months. There’s no way I’m going to voluntarily decide to “remix” my own clothes four times a year. Go ahead and think, “that’s not that often.” And then smack yourself. Because remember when Caedmon was having laser treatments every 3 months? Something you have to do every 3 months comes around too fast. Every single time. It’s also supposed to help simplify your laundry. I don’t know about you, but no matter how many articles of clothing I own, I only wear a certain number of clothes each day. So the laundry burden wouldn’t change for me. I also wear a lot of the same things in every season. Sure, shorts and sandals are pretty much a summer thing. And a few sweaters are only worn in winter. But jeans? V-neck t-shirts? Boyfriend cardigans? Chucks? Most of my long sleeve shirts? All year. (I’m cold natured…and it’s the same temperature inside all year long.) So it really wouldn’t do me much good to switch out even half of my 37-ish items every 3 months. And let’s talk about how many articles of clothing/shoes 37 x 4 actually is. (Not counting your workout clothes, swimwear, undies, and the jeans you wear to paint the living room.) Sure, there are a few that would cross over. Let’s say that you have 10 things you wear all year long or would cross over to multiple seasons. The other 27 items are switched out every 3 months. That’s 118 items. And actually a lot of clothes. At any given time, you’re required to store 81 articles of clothing/shoes. Where are you supposed to put that stuff? It’s not supposed to be in your closet. It’s supposed to be in “storage”. I don’t have that kind of extra space lying around for stuff that could actually fit in my closet. Sure, I keep things I should get rid of. Just today, I went through my side of the closet and donated quite a few items. My general rule is that if I didn’t wear it in the past year, it’s gone. And I haven’t been diligent in that the past couple of years. Generally, if I’m buying something new, it’s probably replacing something I’ve gotten rid of or filling a gap. Just for fun, I counted the items in my closet – including a few quality pieces I’ve chosen to hold onto even though I haven’t worn them in a while. I have about 100 items. That officially leaves me 18 items short. Yet I don’t feel the need to run out and buy 18 new things. I think the main point in the whole Capsule Wardrobe endeavor is to only buy things you love and will wear a lot. With very few exceptions, I already do that. And I always have. So that means I leave a lot of things on the rack at the store. If I don’t love it, or I don’t see myself wearing it a lot, I don’t buy it. It’s pretty simple. I’ve also been known to visit clothes in the store. If I really like something, I’ll keep going back to it each time I’m in the store…usually waiting for it to go on sale. If I really love it every time I see it, I know it would be a good purchase. If I don’t, I know it might not be the best idea, no matter the price. If the official Capsule Wardrobe works for you, then by all means, go for it. I get what it’s trying to do. It’s just not my thing. I can’t really blame my absence here on busyness. Sure, I’ve been busy. But it’s really been more of a writer’s block, so to speak. I didn’t decide to quit blogging or even forget about it. In fact, I’ve thought about it quite a lot over the past several months. It just seemed like I never had the right words to say. Or the things I wanted to say would take way too many words. Things have seemed to be much easier 140 characters at a time. Honor turned 4 last month. FOUR, people. She’s also growing like a weed, keeping pace with her brother’s 2+ inches since the fall. She’s spunky, loud, and lovable. She also keeps her big brother on his toes. There’s never a dull moment around here, to say the least. She’s loved going to Mother’s Day Out this year, and next year will be her last year before kindergarten. And with our swimming lessons, she might actually be full-on swimming in the pool this summer (score for Mom!). We’re all looking forward to summer over here. It’s going to be a bit different for us – at least, different than the past two summers. We only have one trip planned. One. Caedmon isn’t playing baseball. We’re doing some “summer school” (I’ll update on that later), and relaxing. After the crazy schedule we’ve had this winter/spring, I’m really looking forward to spending mornings at the pool, evenings in the garden, and straight chillin’ in between. Ok, so there are other things to be done too, but I think you get the idea. Maybe I’ll even be able to find some words to string together.